Let the AIIEA be proud of the Insurance employees. Insurance Worker has commenced its publication from Bangalore with the current issue. The Journey that began in September 1957 from Calcutta continues uninterrupted. During this great journey, Insurance Worker displayed tremendous courage, maintained ethics and propagated the philosophy of the working class. This monthly journal of AIIEA today has acquired fame for its high standards and is widely respected by the trade union movement of the country. The status Insurance Worker has achieved is due to the tireless and dedicated work of the comrades entrusted with this job at Kolkata. Most of these comrades are no longer with us. We appreciate their contributions and salute their memory. After the publication of the journal was shifted to Chennai, the team led by Com N.M.Sundaram put in enormous efforts to maintain its standards and take it to still greater heights. We record our appreciation and gratitude to Com .M.Sundaram, Com R.Govindarajan, Com V.D.Somasundaram, Com K.David and many other comrades at Chennai for their immeasurable contributions. The greatness of AIIEA lies in the sagacity of leadership to foresee the developments and analyze the situation with correct political understanding which enabled the organization to draw out correct strategy to meet the challenges and also the exemplary unity of the employees in rallying round the flag of AIIEA. Today we take pride to note that AIIEA has occupied a prominent place not only in India but across the world in the comity of Trade Unions. This is possible because of the innumerable sacrifices courted by the leadership as well as many unsung heroes who worked silently and with total commitment and dedication to develop AIIEA to what it is today. 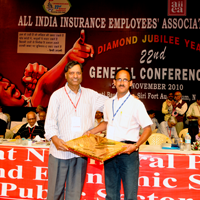 On this occasion let us salute all those comrades who developed and nurtured AIIEA since its inception. You are very good job.